OXFORD, Miss. – Several north Mississippi fourth-grade teachers are taking part in a University of Mississippi study that aims to help children learn more about nutrition while also learning mathematics and English language arts. Called “Fuel to Learn,” the project is funded by a grant from the Mississippi Center for Obesity Research at the UM Medical Center in Jackson and led by Ole Miss faculty, including Melinda Valliant and Kathy Knight of the School of Applied Sciences, and Alicia Stapp of the School of Education. “The vision is that this will become a statewide curriculum,” said Stapp, an assistant professor of health and physical education. “We are starting this very, very small, which is how we want to start, but we hope to have a regional presence and then a statewide presence. Thirteen teachers are participating in the pilot program. In each lesson, students will learn a math or English language arts skill while also learning about healthy eating. For example, one lesson requires students to measure the grams of sugar in multiple beverages and then break that number down into milligrams. The lessons are centered on five “key messages”: hydration, portion size, fruits and vegetables, dairy, and healthy snacks. 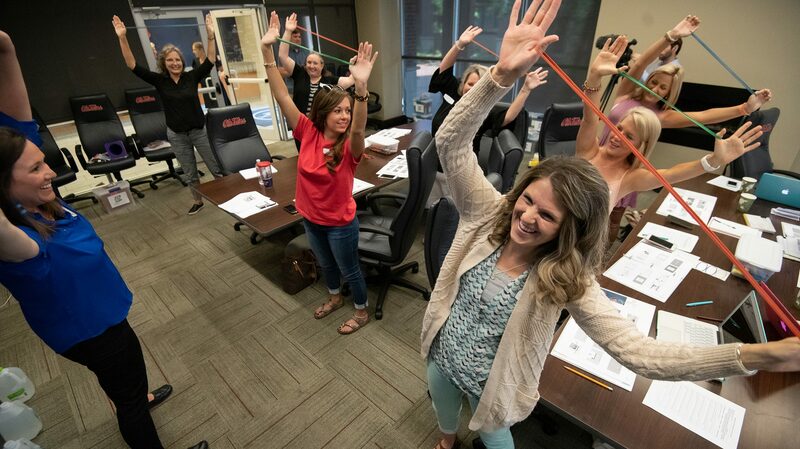 During a meeting July 24 at Ole Miss, Knight, Stapp, Valliant and recent UM graduate Sarah Howell trained the teachers – who hail from Myrtle, New Albany and Potts Camp – to implement the curriculum, which provides ready-to-go lesson plans. The pilot curriculum includes 10 lessons in math and 10 in English language arts. Each teacher received a kit of teaching materials for their classrooms, as well. Each lesson is aligned with Mississippi College and Career Readiness Standards as well as learning objectives in individual subject areas. Developers hope that besides helping students learn, an increased literacy in nutrition will improve long-term educational outcomes. During the event, Knight also explained that research concerning school breakfast programs show that children who eat full breakfasts perform better academically. From September through January, the 13 teachers will implement the pilot with a pacing guide that requires them to use a minimum of two lesson plans per month in their classrooms and upload their results to an online portal. “I think it’s great because it fits into the curriculum that I already teach and goes right along with state assessment,” said Kristi Cox of Myrtle Attendance Center. Between lessons, the teachers took “Brain Breaks,” where they got to know one other better and participated in active movement exercises, which they can use in their own classrooms. The teachers also got a tour of the Olivia and Archie Manning Athletics Performance Center.